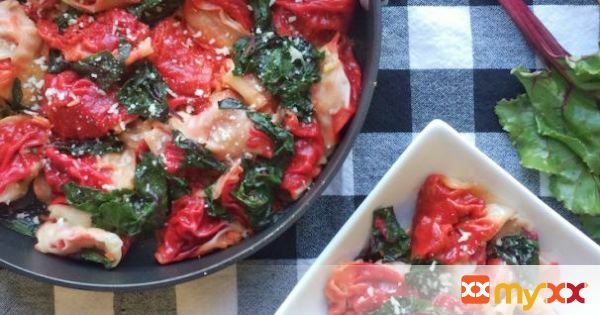 These tortelloni have a beet, bleu cheese and pecorino romano filling and are dressed with sautéed beet greens. 1. Bring a large pot of water to a boil. Cut the tops off of the beets and remove the greens from their thick stems. 2. Chop the greens and set them aside. 3. Boil the beets until fork-tender, about 45 minutes. 4. Drain them, then peel off their skins using your hands under cold running water. 5. Cut one of the beets into chunks and set the others aside for another use. In a food processor, add the chopped beet, bleu cheese, pecorino romano, and egg. Pulse until pureed. 6. You’re now ready to make your first tortelloni. 7. Spoon about two teaspoons of the filling onto one of wonton wrappers. 8. Brush all 4 sides with water. 9. Fold one corner over to the opposite corner, creating a triangle shape. 10. Seal the edges together with a fork. 11. Pinch the two bottom corners together using your thumb and index finger. 12. Sit it up and fold down the top corner, and you’ve made your first one! 13. After about 45 minutes, I had cranked out 34 of these beauties. 14. I botched one of them and I was pretty generous with the filling, so you may end up with more than 34. 15. Don’t stress if they’re not perfect. 16. Bring a large pot of water to a boil for the tortelloni. 17. In the meantime, in a large sauté pan, heat the olive oil over medium-high heat. 18. Add the garlic and beet greens and sauté until wilted. 19. When the tortelloni are done, add the butter to the pan with the garlic and beet greens. 20. Take out the tortelloni using a slotted spoon or spider strainer and add them to the pan. 21. Toss everything, being careful not to break open the tortelloni. 22. Sprinkle with pecorino romano and serve.